Why theater? : I'm primarily a musician by trade (singer, accordionist, pianist, composer), but theatricality has always been an important part of my musical performance. I'd wanted to be a theater major when I first got to Bard, but was quickly discouraged when I wasn't cast in any of the big productions. I wound up majoring in classical voice and piano and for my senior project wrote a cabaret show featuring 19th French chansons and Kurt Weill show tunes arranged for an 8-piece band. I had costumes, monologues, the whole shebang. Upon moving to New York in late 2012 I started playing accordion, writing songs and building my band, Toot Sweet, currently a 4-6 piece cabaret soul group. In the past 6 months, theater has somewhat unexpectedly crept back into my life. I came into this show, Whiskey Pants, off the heels of Mind the Art's The Dream Vault Cycle at La MaMa, which involved me creating a short performance piece with original music. It was the first theater project I was involved with since college (aside from playing in a Fringe show band). It's really exciting and refreshing to come back into theater after having dedicated myself to writing and performing my own music the past two years. I feel really free and present, not in my head or down on myself the way I use to be when approaching acting. I think performing my own music on a regular basis is some of the best theater/acting training I'll ever have. Who do you play in Whiskey Pants: The Mayor Of Williamsburg? 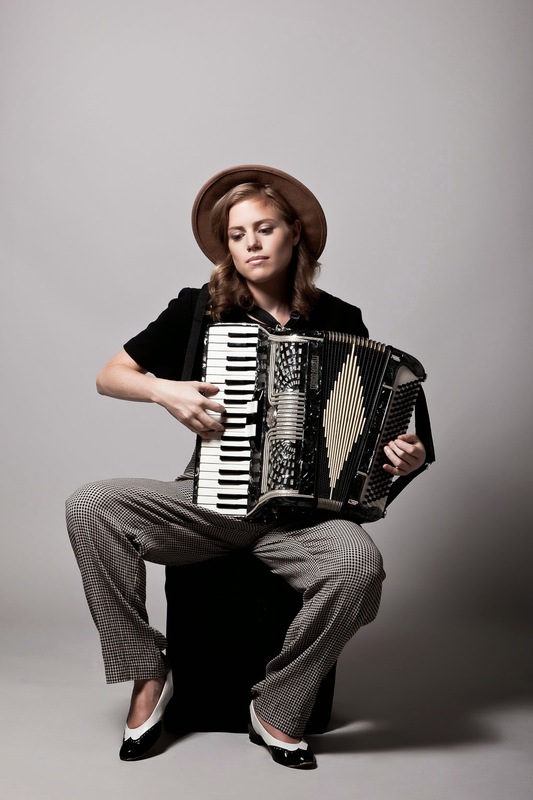 : I play Catherine, the accordion-playing "narrator" of the show - she has a dual role being both company and band member. I use quotations because, while she does stand apart and narrate moments in the show, she also partakes in the culture. I see her as someone who is full of regret, but hiding it well. She's a kind of ghost in purgatory, searching for answers or clues in all of her habitual actions. Stylistically she's like an anime, steampunk, burlesque mashup. Tell us about Whiskey Pants: The Mayor Of Williamsburg: Whiskey Pants is a two-act operetta written by Christian De Gre, Serrana Gay and Joseph Reese Anderson and produced by Mind The Art Entertainment for FRIGID NY. It tells the story of a pseudo post-apocalyptic Williamsburg, in which a drinking competition is held each year to determine the new mayor. Everyone is a lush and no one has a hope or a dream (or at least they don't let on that they do), save for the mayor's daughter and a mysterious young man who wanders into town on the day of the competition. There is plenty of debauchery and absurdity to go around, but the opera also achieves stunning moments of clarity, particularly in the Mayor's soliloquies. These moments are beautiful and heartbreaking. I don't believe most 45 minute shows can pull off such a contrast of expression... and that really speaks to the collective force of the music, libretto, cast and directing. This is a show that operates on hyperbole, but its themes - addiction, apathy, crushed hopes - are all too real. Most of the musical numbers are in odd or constantly shifting meters which gives the music a simultaneously celebratory, manic and driving quality... an ideal setting for the show's themes. What is it like being a part of Whiskey Pants? : This is a very exciting and challenging experience for me. If you had asked me a year ago I never would have imagined I'd be involved in a theater project, much less one as prestigious as this! It's inspiring to work with such creative professionals (or professional creatives). We've had a scarily short amount of time to put this all together, but I have complete faith that we will rock it hard. What kind of theater speaks to you? What or who inspires you as an artist? : I like musicals, but only certain ones. I grew up watching all of the Rodgers & Hammerstein movies and still find those to be the most beautiful and perfectly written show tunes. I discovered Kurt Weill in college. That music hit me on a gut level... it was dissonant and nasty and supremely satisfying. I love opera, particularly in an intimate setting. After college, I worked in Philly as an administrator at Center City Opera Theater, a company that commissions new operas and produces intimate, site-specific performances. My favorite show was a production of Donizetti's Elixir of Love that was staged outside in the Italian Market. As the romantic leads sang their final lovers duet, the sun began to lower behind their heads. It was site-specific theater magic. Any roles you’re dying to play? : I'm not a trained dancer, but I would LOVE to play a difficult dancing role like Velma Kelly in Chicago. What’s your favorite showtune? : I'm extremely moved by "Something Wonderful" from The King and I, in which Lady Thiang, the king's chief wife explains to Anna that she loves and stands behind the king unconditionally precisely because of his flawed and brutish nature. It portrays her as someone who is practical and accepting of her circumstances, but full of love and strength. The song is short, but packs a powerful punch. If you could work with anyone you’ve yet to work with, who would it be? : I'm a big admirer of David Byrne. I recently read his book "How Music Works" and there's a whole segment about how he studied diverse theater cultures, particularly in the Far East, early in the career of Talking Heads and found ways to bring those elements into his own musical performances. As a musical artist, I'm also striving to construct a well-rounded and theatrical show concept. Who would play you in a movie about yourself and what would it be called? : I'd like to pretend I grew up half a century ago and have Ann Margret playing me in a slightly campy and noirish 60s movie called "The Little Dreamer"
What show have you recommended to your friends? : I saw the concert version of the David Byrne/Fatboy Slim collabo Here Lies Love. I thought the music was really interesting and recommended it to many friends. I'd like to see D.B. write more musicals. What’s your biggest guilty pleasure? : Driving my car into Manhattan at rush hour (it's also extremely masochistic... but often preferable to lugging my accordion onto a crowded subway train).